As scheduled by All Unions and Associations of BSNL, Joint Convention was held at Guwahati on 27/11/17 at Panbazar IQ conference hall. The hall was jam packed with executives and non executives of BSNL. All unions and Associations took part in this convention. One presidium of Circle Secretaries including Com Swarup Chakraborty CS/AIBSNLEA/ASSAM. Com. Prasun kumar Mukhopadhyay OS(East)/CHQ/AIBSNLEA represented the CHQ/AIBSNLEA and addressed the house. Congratulations! AIBSNLEA got stay orders in the Principal CAT New Delhi today for the DoT order dated 5.7.2017 for withdrawal of additional increment by fixation in same scale on post based promotion under EPP. The case filed by AIBSNLEA vide OA/100/2649/2017 in Hon'ble Principal Bench CAT New Delhi against the DOT order dated 05.07.2017 came up for hearing today in the Principal Bench of Hon'ble CAT (Court No. 5 Item No. 37). In today's hearing DoT advocated asked a copy of the reply submitted by the advocate of BSNL in the Hon'ble court and requested for some time to study it. On it, our advocate argued. However, Hon'ble PB CAT posted the matter for further hearing on 11.12.2017 and till then kept the DoT order dated 05.07.2017 in abeyance. 27.11.2017: Veteran telecom trade union leader Comrade R.K. Kohli has passed away on 26.11.2017 morning at New Delhi. Comrade Kohli was a stalwart in the trade union history since P&T era. AIBSNLEA pays sincere and respectful homage to the departed leader, and also pays it's heartfelt condolences to his family members and comrades. All Unions and Associations of BSNL have served a notice for two day strike on 12th and 13th December 2017. <<<Click here for the letter >>>>>>. AIBSNLEA is also a constituent of this forum and requests all of its Circle / District Secretaries to ensure 100% participation in the proposed STRIKE on 12th and 13th December 2017 on the call of all the Unions and Associations of BSNL. BSNL Corporate Office issues instructions for sanction of special CL to the CHQ Office Bearers of AIBSNLEA for attending the meeting on 01.12.2017 and 02.12.2017 at Jaipur Rajasthan. 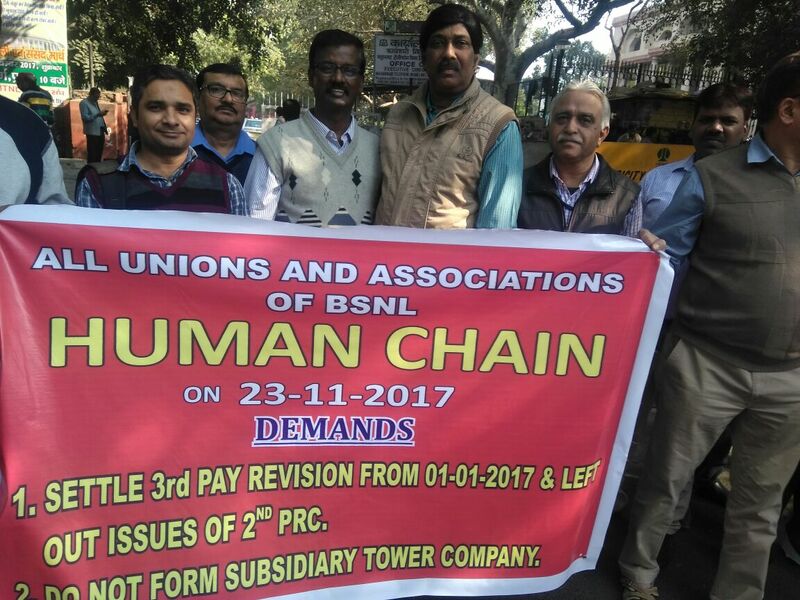 On the call of all Unions and Associations of BSNL Human Chain has been organized all over the country with full zeal and enthusiasm. 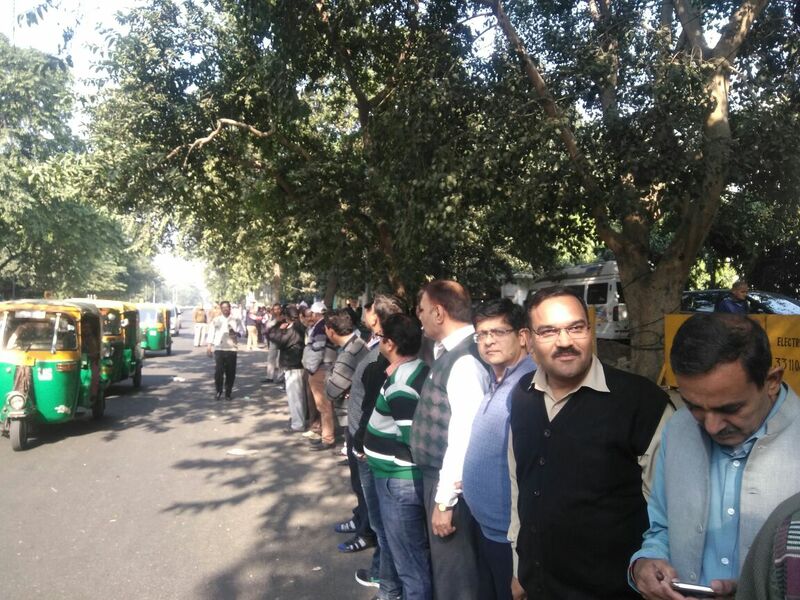 At BSNL Corporate Office, New Delhi also, the Human Chain was organized at mass level wherein almost all the executive and non-executive employees participated in the human chain. A Joint Convention was organised in Patna, Bihar on 21/11/17 and Kolkata on 22/11/17 with huge gathering. The Patna meeting was addressed by Com Krishnakumar CS and Com Prasun Kumar Mukhopadhyay OS (East)/CHQ. KOLKATA meeting was presided over by one presidium including Com Anirudda Basu CS WB circle and Com Subhasis Mitra CS CTD and addressed by com Prasun Kumar Mukhopadhyay OS East/ CHQ. All Unions and Associations leaders took part in these conventions. The Union Cabinet chaired by the Prime Minister Narendra Modi has approved the Wage Policy for the 8th Round of Wage Negotiations for workmen in Central Public Sector Enterprises. In this policy it is clearly mentioned that in those CPSEs for which the Government has approved restructuring / revival plan, the wage revision will be done as per the provisions of the approved restructuring / revival plan only. A Implementation of 3rd PRC recommendations with 15% fitment benefits in BSNL: We requested for implementation of 3rd PRC recommendations with 15% fitment benefits in BSNL as per the BSNL Board’s decision which is already sent to DoT for approval and issuance of Presidential Directives. AST mentioned that the BSNL’s proposal on 3rd PRC recommendations with 15% fitment benefits in BSNL is being processed. During the discussions, the AST was responsive. B Payment of Pension contribution on actual basic instead of maximum of the pay scale: We requested to consider payment of pension contribution on actual basic instead of maximum of the pay scale. AST mentioned that the BSNL’s proposal in this regard was considered and decided that DoT can not recommend payment of pension contribution on actual basic instead of maximum of the pay scale to DoE in view of the fact the pension contribution paid by BSNL for their employees is on different substantive grade pay scales and thereafter the employee is being retired in higher scale. So initially the pension contribution was paid in lesser amount to DoT DoT as per the lower scale. We further pleaded that the 6th CPC in the year 2006 had recommended pension contribution to be taken on actual basic pay of the employee. In view of that, it should be considered on actual basic but AST was firm on his decision. C Revision of the Pension of BSNL Pensioners: We requested AST to take an early action for revision of the pension of the BSNL pensioners who are drawing Govt. Pension under Rule 37A. We explained that Sr. DDG (Estt), DoT is mentioning that the revision of pension of BSNL pensioners will be considered after the pay revision of BSNL serving employees on implementation of 3rd PRC recommendations otherwise, there will be a disparity in the pension of the BSNL pensioners who will retire later on. AST after giving patient hearing told that we will look into the mater for an early action in this regard. GS, AIRBSNLEWA gave a letter to AST in this regard which he marked immediately to the concerned section for taking an early action. D Additional increment case on post based proposition under EPP: AST categorically mentioned that the matter is sub-judice so he can not make any comment on this issue. E Restructuring of AD (OL) cadre in BSNL: We requested to give clearance to BSNL on restructuring of AD (OL) cadre. AST assured to look into. GS, President, AGS (HQ), AGS (FIN ) and AGS (DR) met with PGM (Pers.) and discussed about proposed Draft CPSU cadre hierarchy. PGM (Pers.) initiated the discussion by reiterating the MC direction that CPSU proposal is being discussed with associations to make policy more employee and organisation centric. We told that response submitted by AIBSNLEA contains para wise suggestions, by considering them Policy can be made beneficial for both employee and organisation. We reiterated our stand that all pending CPCs should be completed and promotion orders should be issued before implementation of CPSU cadre hierarchy and priority should be given to conduct CPCs first to fill up all the vacant post of Group- 'A' and Group-' B'. Pers. cell need to take legal opinion wherever required, to break the stalemate in promotions in various cadres as per DOP&T guidelines on SC/ST rosters implementation. PGM (Pers.) assured to work out some way to complete the CPCs processes and issue promotion orders and simultaneously finalise the CPSU Hierarchy. We strongly opposed the MT recruitment provision at STS level in the CPSU cadre hierarchy. PGM (Pers.) told that management trainee is need of the organisation. We mentioned that AIBSNLEA will never accept MT at STS level. We categorically told that MT recruitment at STS level will block the career prospects of all the existing executives at JTO / JAO and SDE / AO level and they will retire at AGM level only. If management feels that BSNL need market talent then recruit MT in Sales, Marketing, HR and Legal etc. at JTO/JAO level only. Engineering and Finance vertical are already having executives at JTO / JAO equivalent to Management Trainee. Along with this, If management feels that there is requirement at policy making level, BSNL may recruit higher management professionals at GM level with suitable experience and probation. We also opposed ignorance of length of service and seniority in proposed draft and increase of resend period for AGM grade from 7 years to 12 years. Residency period from SDE to AGM and equivalent cadre should be maximum 7 years only. We suggested the benchmarks should be on basis of Khan Committee report and numeric based to avoid huge dropping. 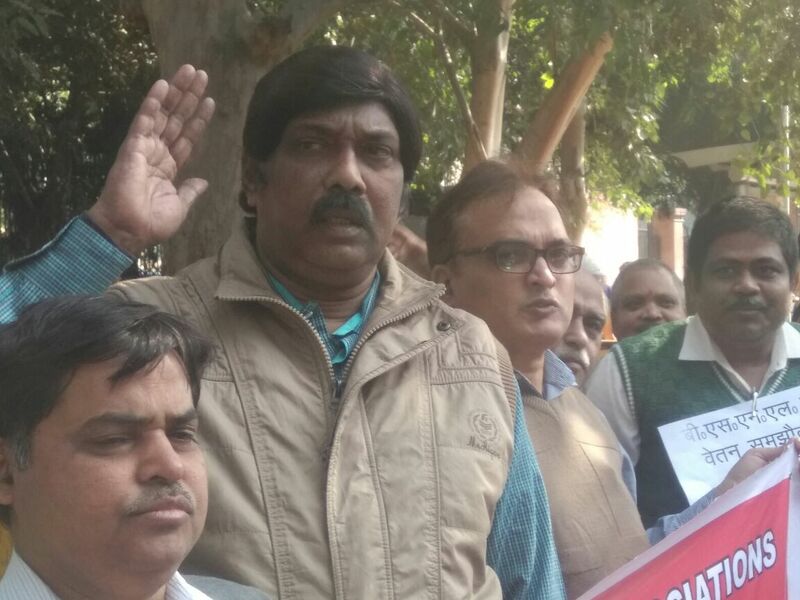 We also suggested that implemention of date of CPSU Policy should be from the date of last CPC held in that cadre instead of 01.01.2017, otherwise it will not be beneficial to the executives in the Cadre (s) having more than 20 years of service. The executives already in E5 scales should be given the designation of Jt. DGM immediately as per Khan Committee report. We suggested that before going to any final decision all cadre controlling authorities like Civil , Electrical , Arch, Finance, TF and CSS etc. should be consulted and taken care of their views / suggestions also. We further suggested that Pers. cell may convene a joint meeting of all executive associations for more deliberation and making a consensus on CPSU policy which is more employee and organisation centric. At last we requested PGM (Pers) that he should go through our view and suggestion with open mind to make CPSU Cadre hierarchy to become reality. He assured to apprise AIBSNLEA views to BSNL management committee for consideration. AIBSNLEA will have a meeting with Addl. Secretary (T), DoT tomorrow at 14.30 Hrs and will have discussions with PGM (Pers.) on CPSU Cadre Hierarchy draft proposal submitted by AIBSNLEA tomorrow morning at 10.00 hrs. GS President met CMD BSNL and apprised him about our discussions with Hon’ble MOSC (I/C) on implementation of 3rd PRC recommendations in BSNL and his comments. CMD BSNL mentioned that it is beneficial for BSNL that DoT should approve the BSNL Board proposal on 3rd PRC. He assured to continue his efforts in DoT to get the proposal approved. GS, President, FS and AGS (HQ) met Hon’ble MOSC (I/C) Shri Manoj Sinha Ji and submitted a memorandum requesting implementation of 3rd recommendations in BSNL with full 15% fitment benefit. We further requested him that BSNL Board has already approved that proposal on implementation of 3rd PRC recommendations in BSNL and has sent the proposal to DoT for approval wherein your kind intervention is required in getting exemption on the affordability clause from Govt. We also quoted the example of FCI which is also a Govt. converted PSU and was formed with a specific agenda and exempted from the affordability clause. Similarly, BSNL should also be exempted from the affordability clause since it was also formed from 1.10.2000 with a specific agenda on the basis of NTP-1999 to provide Telecom Services to the customers on affordable rates and to ensure national security. Hon’ble MOSC (I/C) appreciated our concern and mentioned that they are communicating BSNL Board shortly in this regard. GS met Director (HR) and discussed regarding CPSU Cadre Hierarchy proposal. He submitted AIBSNLEA views/suggestions and requested for consideration. Director (HR) after discussions mentioned that first we should complete our discussions with PGM (Pers.) on this issue and thereafter she may be apprised. We further requested that CPCs should be expedited immediately subject to outcome of the court judgments. Director (HR) assured to look into the matter. Implementation of 3rd PRC in BSNL: We requested Director (HR) to use her good office in DoT to get clear BSNL Board decision on 3rd PRC from DoT. Director (HR) mentioned that the BSNL Board proposal on 3rd PRC is under consideration in DoT. It is learnt that Hon’ble MOSC (I/C) has asked Secretary (Telecom) to examine the case at the earliest. All the Circle / District Secretaries are requested to ensure timely dispatch of these pending APARs at the earliest so that the long awaited DPC can be held. GS, President, GS AIRBSNLEWA met Sh. A.N. Rai, Advisor to Hon'ble MOSC(I/C) & discussed regarding implementation of 3rd PRC in BSNL & revision of pension of BSNL Pensioners. We requested to use his good office in resolving these issues in DoT. Advisor to Hon'ble MOSC(I/C) immediately spoke to DDG(Estt.) DoT & discussed the matter that why there is a delay in revision of pension of BSNL Pensioners. DDG(Estt.) DoT explained him that 3rd PRC implementation in BSNL is under consideration & till their is a decision in this regard, the pension revision is kept pending. Advisor to Hon'ble MOSC(I/C) assured him to atleast process the case. Advisor to Hon'ble MOSC(I/C) assured to arrange our meeting with Hon'ble MOSC(I/C) at the earliest to discuss the matter. GS, President, GS AIRBSNLEWA met Sr. PPS to Secy(T), DoT & Addl. Secy(T), DoT & requested for grant of meeting to our Association. The Addl. Secy. (T) meeting time is fixed up on 22nd Nov., 2017 at 14.30 hrs. & with Secy(T), DoT at 17.00 Hrs. to discuss the pressing issues. GS, President, GS AIRBSNLEWA met Sh. Prabhas Kumar, Member (S), Telecom Commission, DoT and discuses regard implementation of 3rd PRC & revision of pension of BSNL pensioners. Member(S) after discussions assured to discuss the matter with DDG(Estt.) for an early action. GS and President met Director (PSU), DoT who informed that the proposal of BSNL on implementation of 3rd PRC recommendations in BSNL has been received in DoT and is under process. 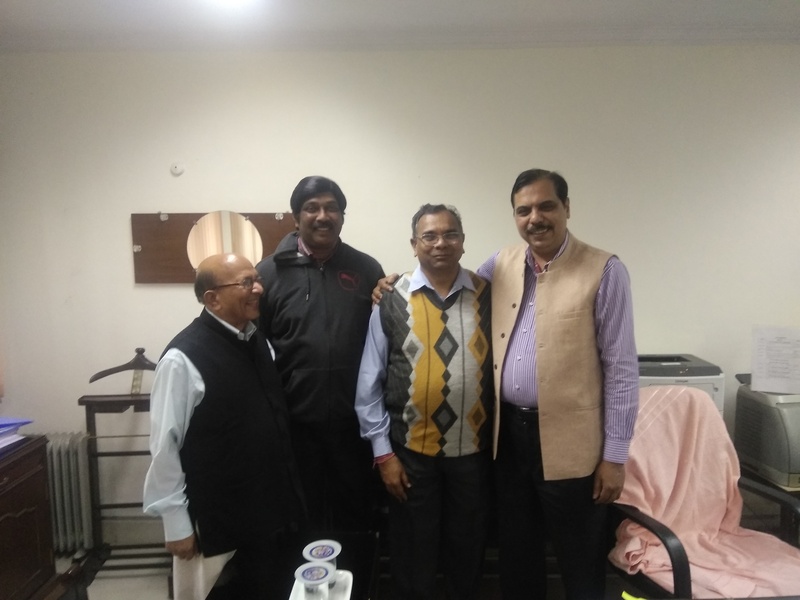 GS, President and GS AIRBSNLEWA met Shri Prabhas Kumar, Memeber (S), Telecom Commission, DoT and greeted him on assuming the high office of Memeber (S), Telecom Commission, DoT and assured him fullest support. GS, President, AGS(F), AGS (HQ) and AGS (DR) met with PGM (Pers) and discussed. CPC from JTO to SDE (Telecom. ): We requested to get vacated the stay order on promotions from JTO to SDE (Telecom) from the Hon'ble High Court Kerala. PGM (Pers) mentioned that BSNL has filed one complaint petition to the Hon'ble Chief Justice Bench of Kerala High Court for early pronouncement of the Judgment and therefore pronouncement of the Judgment is expected by end of this month. After getting stay order vacated the CPC will be expedited. CPCs from JTO to SDE, SDE to DE, JAO to AO, AO to CAO, SDE(C) to EE(C) etc- We requested to fill up the vacant posts of SDE/AO and DE/CAO. PGM (Pers) mentioned that CPCs in these cadres can be conducted only after the directions are received from Hon'ble Apex Court on pending SLPs. He further informed that Supreme Court has agreed that the matter will be considered by five-judge bench. After the directions of Hon’ble Court CPC will be conducted. GS, President, AGS (HQ), AGS (Fin), and AGS (DR) had meeting with PGM (Pers.) on CPSU cadre hierarchy. The meeting was scheduled as per direction of the Management Committee of BSNL Board. GM (SR), Jt. GM (Pers) and DGM (Pers-II) were also present in the meeting. AIBSNLEA submitted its detailed Para wise response to the draft policy approved by BSNL Management committee. PGM (Pers) had apprised that purpose of the MC‘s direction to discuss with associations to make policy more employee and organization centric. He requested that AIBSNLEA should support the policy to break the stalemate in the promotions of executives in BSNL. AIBSNLEA made it clear that we are never against the CPSU hierarchy rather we have been demanding it to implement in the true sense and as per Khan Committee recommendations. We further clarified that our suggestions are to safe guard the interest of the entire executives and it will give value additions to it. In view of this Pers. Cell should carefully go through our views / suggestions with open mind without any prejudice. Then point by point discussion was held. While discussion, we strongly opposed the MT recruitment, ignorance of the weightage to seniority, reduction of sanctioned strength, increase in eligibility condition from of 7 to 12 years for the promotion of SDE/AO to DE /AGM/CAO, Time bound promotion in SG-JAG grade should be in E7 instead of E6 etc. PGM (Pers) appreciated our concern in this regard and impress upon to consider MT Recruitment to full-fill the management requirement immediately but we categorically told that AIBSNLEA is firm on its stand and will not accept MT Recruitment at STS level which will block the career progression of executives. Today the meeting started at 15.00 hrs as per the schedule and continued till 18.00 hrs thereafter, PGM (Pers.) mentioned that he will study the submissions made by AIBSNLEA point by point and thereafter he will discuss the matter with AIBSNLEA again on 22nd and 23rd Nov, 2017. 14.11.2017 All Unions and Associations of BSNL, held at New Delhi on 14.11.2017 - Decisions taken in the meeting of the. A meeting of the All Unions and Associations of BSNL, was held at New Delhi today the 14.11.2017. Com. Chandeswar Singh, GS, NFTE, presided over the meeting. General Secretaries / representatives of BSNLEU, NFTE, SNEA, AIBSNLEA, AIGETOA, FNTO, SEWA BSNL, BSNL MS, AIBSNLOA, BSNL ATM, BSNL OA and BEA BSNL attended the meeting. Comrade GS and Comrade President attended the meeting from AIBSNLEA side. The following decisions are taken unanimously. 1. The date of the human chain is changed, with a view to facilitate more time for the mobilization. Now, the human chain will be held during lunch hour on 23.11.2017. 2. The strike notice for the two day strike, to be held on 12th & 13th December, 2017, will be served on the Management and the DoT on 23.11.2017. 4. The last date for submission of memorandum to the Hon’ble MPs has been changed to 30.11.2017. A copy of the memorandum to be submitted to the Hon’ble MPs, will be circulated within a day or two. 5. Posters and hand bills will be printed at the All India level, by the All Unions and Associations of BSNL, in English and Hindi, and it will be sent to the circles. The expenditure for these will be borne by all the unions and associations. The posters and hand bills should also be printed in the regional languages, at the circle level. 6. To effectively organize the strike, meetings will be organized in important cities / centers, as per the following details. All India leaders of the All Unions and Associations of BSNL will address these meetings. 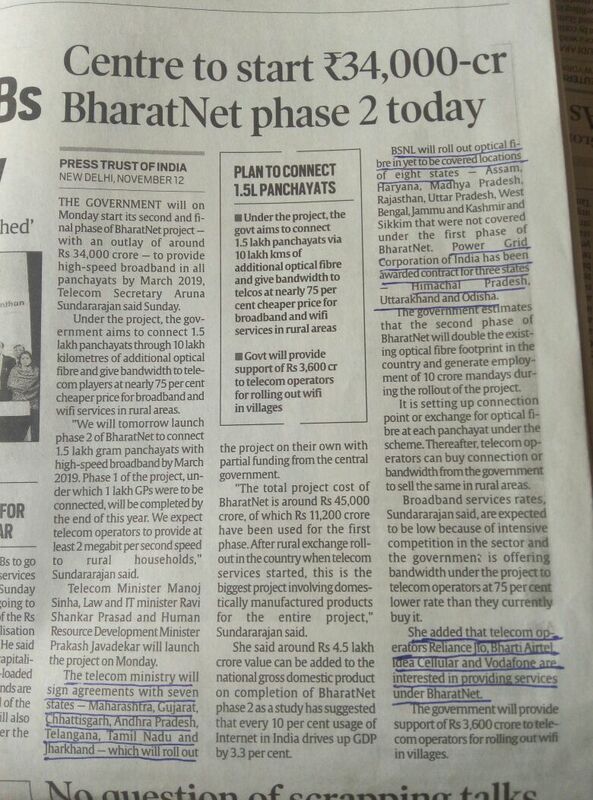 (i) For implementation of 3rd PRC with 15% fitment benefit in BSNL and pending issues related to 2nd PRC. (ii) To protest against creation of BSNL's Tower Subsidiary. The date of the human chain is now changed with a view to facilitate more time for the mobilization. 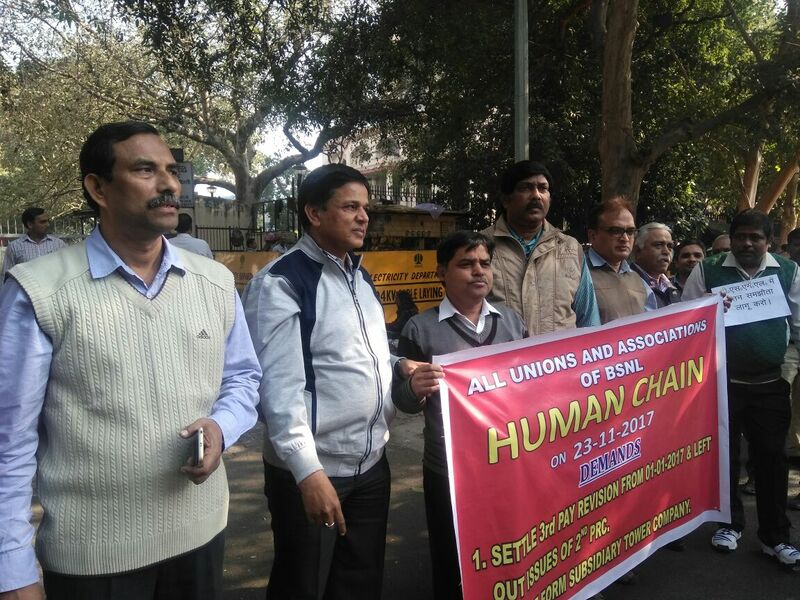 Now, the human chain will be held during lunch hour on 23.11.2017 at BSNL Corporate Office, Circle and District levels. The pros and cons on implementation of the Draft Rectt./Promotion Rule, proposing Time bound functional promotion upto AGM grade for all cadres / streams are as under:-. Pros: The modified policy implementing w.e.f. 01.01.2017 will provide time bound functional promotion upto AGM level which will benefit the newly recruited executives, recruited after 2010. Cons: The modified policy implementing w.e.f. 01.01.2017 will not give benefit to the senior executives in the cadre having more than 20 years of service which will cause frustration and discontentment among them. For example, one JTO recruited in the year 1995 and completed 21 years of service is still waiting his first functional promotion as a SDE and one JTO recruited in the year 2011 completed 5 years of service will get SDE promotion together. No service weightage to the senior executive is ensured. 1.3: On approval of the policy, all existing RR in the grade of SDE /equivalent will be treated as scrapped and MSRR 2009 will be modified to the extent that promotion of AGM/DE Grade in all the schedule-IA, IB, IC & ID shall be treated to be deleted. Remaining portion of MSRR shall be continued to be followed as per the existing provision. MT recruitment will continue as per the existing provision of Recruitment Rule of MT. Pros: MT recruitment at STS level as per the existing provisions of recruitment rule of MT, It may help in filling up Top level SAG/HAG level post on fast track method through MTs of outside and inside quote. Few of Group B level executives will also get a chance to become MT through this process. Cons: MT recruitment at STS level will block the career progression of Group B level executives as we have experienced in DOT setup through JTS OF ITS Grup A recruitment rules 1991. Where in one DR JTO of DOT used to retire as Adhoc DE after completing 37-38 years of service. The similar situation will develop in BSNL after the introduction of MT recruitment. 1.4: Powers for relaxation/ modification/ amendment to these rules will vest with the Management committee of BSNL Board. Pros: It will provide easy path to BSNL management to relax/modify/amendment to these rules with the approval of management committee of BSNL Board. Cons: BSNL management, as its own or under the unforeseen pressures may any time relax/modify/amend these rules with the approval of BSNL MC which may be in the interest of executives or against. These rules are approved by the BSNL Board and cleared by DOT may not be allowed to BSNL management to make such provisions since the pension payment is being made by DOT. Pros: As per Deloite recommendations the sanction posts of Group A and B level executives will be reduced the wage payment liability of BSNL through the proposed HR plan. Cons: As per new HR plan based on Deloite recommendations the huge number of sanctioned posts of Group A and B will be reduced which will adversely affect the career progression of BSNL executives by way of stagnation due to non-availability of the posts. 5.1: All the existing Executives up to AGM/DGM(Adhoc) shall continue to be considered for financial up-gradation to the next higher scale upto E-6 scale on completion of 5 years of service from the date of placement in lower scale through conduction of CPC. The benchmarks considered for financial up-gradation shall be as per the prescribed provisions in the schedule. The new Benchmarks shall be applied to those executives whose financial up-gradations are due w.e.f. 01.01.2018. Pros: The stringent benchmark will filtered the executives and the less number of executives will be promoted to the higher post to reduce to number. Cons: The stringent benchmark will block the career prospect of majority executives thus the spirit of time bound promotion on functional basis to all executives will be defeated. Considering this, the benchmark proposed by Khan Committee was appropriate of functional promotions. 5.3 II: All the executives eligible for promotion for a vacancy year i.e. 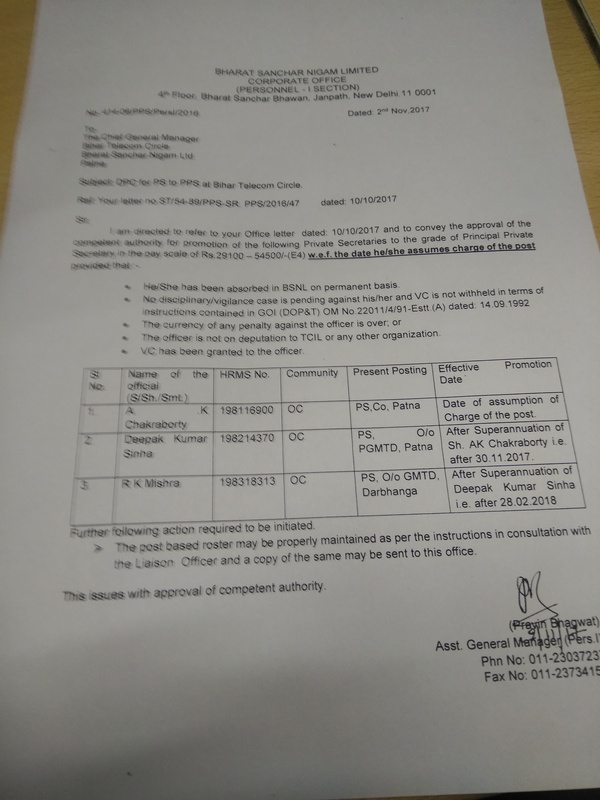 promotion under SCF, for which the result of the LDCE (other channel of promotion) has been issued and promotion order is pending, the promotion of executives of both the channel shall be considered deemed to have been promoted before 1.1.2017 and they shall be treated en-bloc senior to the executives promoted as per this Rule. Pros: The promotion of executives of both the channel shall be considered deemed to have been promoted before 1.1.2017 and they shall be treated en-bloc senior to the executives promoted as per this Rule. It will depend upon the year to year vacancies. Cons: The executives of LDCE quota appeared through a particular vacancy year will continue to claim their seniority along with the vacancies of SCF quota. It may invite litigations and derail the process. 12.0: The executive shall join the place of posting on promotion within 40 days of the issue of the order of promotion by BSNL CO. The period of 40 days may be extended in exceptional and deserving case, in the interest of service, where the Administrative requirement so demands with the approval of appointing authority. In case the Executives who are granted functional promotion but fails to join the promoted grade within the time or decline promotion, then Management reserves the right to forfeit his promotion and executive shall not be considered for functional promotion or financial up-gradation to higher scale for next one Year or next CPC whichever is later, from the date of deemed refusal (after 40 days) or from date of application of refusal. Pros and Cons: If on promotion outside circle one is forced to refuse due to medical/ family issues, he will stagnate in his own pay scale as there is no financial upgradation. This type of situation should be relaxed and genuinely should be weighted. 16.0: New designations for Executives: In the Policy new Designation has been incorporated and shall hereafter be followed at all levels at H.Q./Circle/SSA etc. Pros and Cons: Khan committee has no where suggested Sr. SDE as functional promotion and tightening the norms by deciding even one "Average" as disqualification in promotion for JTO, SDE, Sr. SDE, DE cadres i.e. for the span of 20 years. We strongly submits that there is no need to alive the Sr. SDE cadre. By this inclusion the Executives will be derailed from their justified promotions and will be bound to remain in the same pay scale for 10 years, which is the violation of EPP. We strongly oppose such inclusion. AIBSNLEA has notified a meeting of its Central Office Bearers (CHQ), Advisors (CHQ), Consultants (CHQ), Circle Secretaries and Circle Presidents at Jaipur on 1st and 2nd December 2017. Accordingly, all the Circle Secretaries are requested to give arrival and departure details of the Central Office Bearers (CHQ), Advisors (CHQ), Consultants (CHQ) and Circle Presidents of AIBSNLEA along with his/her arrival and departure details to CHQ immediately for making their stay at Jaipur comfortable and pleasant one. It is once again reiterated that the boarding and lodging arrangements will be made available for the participants at Jaipur with effect from 30.11.2017 afternoon to 03.12.2017 morning only. Overstay will have to be born by the concerned participant him/herself. For more details, Shri N.L. Sharma, AGS (HQ): Mobile No. 9868115301 and Shri M.K. Morodia, Circle Secretary, Rajasthan: Mobile No. 94133958585 may be contacted. (i) CPCs from JTO(E) to SDE(E) & SDE(E) to EE(E): We expressed our concern against non filling up of vacant 120 SDE(E) posts on regular basis and a bout 32 vacant EE(E) posts. PGM(EW) mentioned that due to court cases pending on SC/ST Roster implementation, the CPCs could not be initiated. We explained that since there is no court cases pending in JTO(E) to SDE(E) & SDE(E) to EE(E) , thus CPCs can be initiated and expedited. PGM(EW) after having discussions with AGM(Admin.) EW Wing assured to move the proposal for initiating CPCs to fill up the vacant SDE(E) /EE(E) vacant posts. He assured early action in this regard. 08.11.2017 Meeting with Dir(HR) BSNL Board. 1. Implementation of 3rd PRC with 15% fitment benefit in BSNL and settlement of E-2 & E-3 standard pay scales to the JTO & SDE equivalent executives in BSNL: We requested to get settled both the cases from DOT at the earliest to avoid unrest among the employees. Dir (HR) informed that she along with GM(Estt.) has met PS to Hon'ble MOSC (I/C) Shri Niteshwar Kumar and has discuss the matter on E-2 & E-3 pay scale issue and he has assured to appraised the issue to the Hon'ble MOSC(I/C) for review the PO since the earlier PO has been issued with the approval of Hon'ble MOSC(I/C). On the issue of 3rd PRC report the BSNL Board has approved for its implementation with 15% fitment benefit and the same proposal will shortly be sent to DOT she immediately directed GM (Estt.) for sending the BSNL Board approval on 3rd PRC implementation for approval to DOT immediately. Dir (HR) mentioned that approval on 3rd PRC from DOT fully depends on Hon'ble MOSC (I/C) & Secretary (T) support. Since, the middle level administration in DOT is not favorable. On the issue of payment of pension contribution on actual basic instead of maximum of the pay of BSNL employees to DOT. Dir (HR) mentioned that matter is still pending in the establishment cell of DOT to reply DOE queries wherein internal finance of DOT has also asked many quires in this regard. It seems that DOT Administration is not favorable to recommend the case to DOE. 2. Holding of CPCs to fill-up the vacant Group-B and Group-A level vacant posts: We expressed our serious concern against the non-filling of the Group-B and Group-A level about 17000 vacant posts on the pretext of pending court cases. PGM (Pers) informed that Three SLPs have been filed in the Hon'ble Supreme Court against the Judgement of Hon'ble High Court Chandigarh on SC/ST roster implementation in BSNL the case was heard in the Registrar Court on 27th Oct.2017 wherein the notices have been issued to all concerned and now the next hearing is expected in the middle of Nov. month. He explained that we have requested to the Hon'ble Supreme Court to give us the clear direction that whether the Hon'ble High Court Chandigarh Judgement has to be implemented of the DOP&T guidelines should be implemented on SC/ST roster in BSNL to fill-up about 17000 Group-B and Group-A level vacant posts in the interest of BSNL and its executives. He opined that on this hearing Hon'ble Supreme Court may give clear cut direction in this regard and on that basis the CPCs will be conducted immediately. Dir (HR) also informed that she along with PGM (Pers) has met BSNLs senior Advocate and discussed the matter for an early decision in this regard. 3. Withdrawal of additional increment on promotion in the same pay scale after time bound promotion under EPP: Dir (HR) asked the status of the court cases in this regard from PGM(Pers) and GM(Estt.). We expressed our concern that on 6th Nov-2017 the case was heard in the Hon'ble PB CAT New Delhi filed by AIBSNLEA in the month of July-2017 against DOT order dated 05.07.2017 wherein for the last three hearings DOT Counselor shout time to file the reply and finally DOT filed the reply in Oct-2017 thereafter immediately AIBSNLEA Advocate also filed the rejoinder which was heard on 6th Nov-2017 in which Ist time BSNLs Advocate appeared and demanded the MA copy and requested for adjournment of the Court for next 3 weeks wherein the now case is posted for hearing on 28th Nov-2017. Dir (HR) express her anguish against towards BSNLs Advocate late appearance and further delaying the case. She directed CGM (Legal) and PGM (Pers) to deal the case on priority for an early decision so that the pension cases can be settled accordingly. 4. Implementation of CPSU cadre hierarchy in BSNL: We expressed our resentment towards the attitude of PGM (Pers) for not discussing the draft proposal with AIBSNLEA 2nd majority Executive Association on CPSU cadre hierarchy before placing to the management committee of BSNL Board wherein many discrepancies are seen which will harm the assured carrier progression of BSNL Executives. The Khan Committee recommendation which were finalized after the signature of three Executive Associations i.e. AIBSNLEA, SNEA and AIGETOA has been diluted/ deviated which is not acceptable. We also mentioned that AIBSNLEA have been demanding implementation of CPSU hierarchy in the line of Khan Committee report. Dir (HR) mentioned that Management Committee of BSNL Board has directed to discuss the draft proposal with all stake holders before its submission to the BSNL Board for approval and now you have opportunity to put forth your views in this regard. She directed PGM(Pers) to discuss with AIBSNLEA on point to point basis and to take out view for further submission to the management committee of BSNL Board. She also directed GM(SR) to be present in the meeting on 15th Nov.2017 at 15.00 Hrs in the Chamber of PGM(Pers) and thereafter she will personally discuss the matter with AIBSNLEA before its submission to Management Committee of BSNL Board. During the discussions with Dir(HR) the PGM(Pers), GM(Estt. ), GM(SR), Jt. GM(Pers) and DGM(Estt.) were also present in the meeting. Com. GS, President, FS, AGS (HQ) and AGS (DR) attended the meeting. All the members are requested to give their views/suggestions to CHQ immediately for further discussion with BSNL Management. Director (HR), BSNL Board has called AIBSNLEA for discussion on the matter tomorrow afternoon at 12.00 pm. Thereafter, PGM (Pers.) has fixed up the meeting with AIBSNLEA on 15.11.2017 to discuss the matter further. The Majority Association is now busy in sugar-coating the quinine pill on behalf of the Management. Anyone who will read the posting in the website of SNEA dated 5-11-2017 will certainly wonder whether it is a message from a trade union or management. The write-up resembles very much with the appeals generally posted by GM (SR) to console agitated employees. It is claimed in the website that the draft proposal posted in our website is no way connected to the proposal approved by MC and informed that the full proposal will be posted by them once they receive it from management. This means that they are waiting the detrimental cadre hierarchy order to be approved and issued before circulation. Cowards Act. If they have courage let them come out and say which point in the draft proposal uploaded by us is wrong and what is the right. For what this hush hush is all about ? It is propagated that the "promotion will be without fresh CPC and without delay". What's the meaning of fresh CPC and no delay. Will the present system of evaluating APAR and VC will be dispensed with. At present VC is valid for 3 months and CPC conducted for the eligible candidates. Then how delay can be avoided and there will be no need of fresh CPC. Shamelessly it is written that " Khan Committee recommendation is implemented as it is 5-5-5 years except for benchmarks which are slightly tightened by the management." Khan committee has nowhere suggested Sr. SDE as functional promotion and tightening the norms by deciding even one "Average" as disqualification in promotion for JTO, SDE, Sr SDE, DE cadres i.e. for the span of 20 years is "slightly tighting " in the eyes of the majority Association. What a desperation to cover the misdeeds of the Management. The committee headed by Mr Khan, Ex. ED (NB) deliberated the issue on CPSU Cadre Hierarchy at length where all the executive Association has given there opinion. 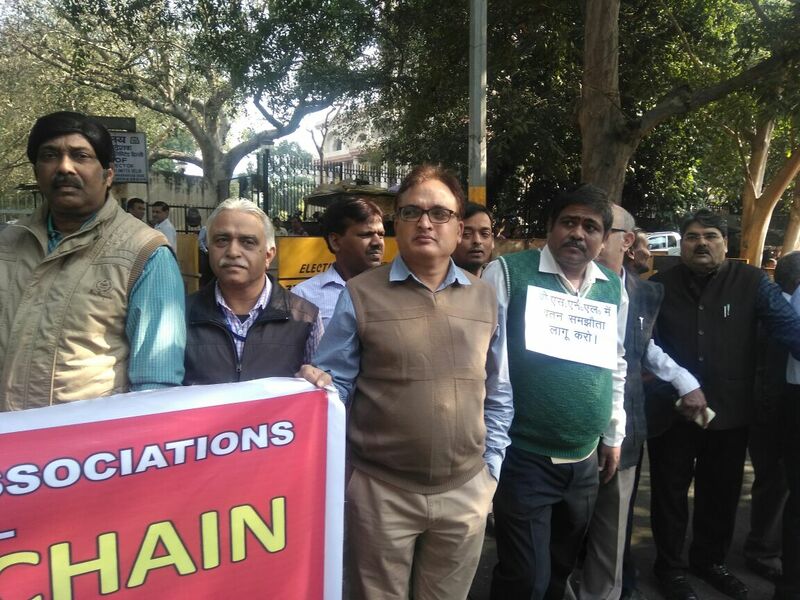 After taking opinion of all, the report was signed by all Associations including SNEA. Now what is the necessity and compulsion on part of SNEA to deviate from the report that too secretly and without discussion in any forum. Why SNEA is overactive to convince the executives about the good (?) points in the new proposal. CPSU Cadre Hierarchy is for executives who are qualified enough to understand themselves what is good and what is bad for them. They why this extra initiative? When EPP was drafted there was no need of secrecy and education. All Executives welcomed the scheme because it was good for them. Therefore without wasting the energy on preaching let the majority Association come out with the total scheme as they categorically mention the draft proposal uploaded by us is far from reality. We appeal to the Majority Association please stop such actions to damage the entire executives cadre for may be some fringe benefit for some people. 06.11.2017 Status of the Court Cases against the DoT order dated 5.7.2017 for withdrawal of additional increment by fixation in same scale on post based promotion under EPP. The case filed by AIBSNLEA vide OA/100/2649/2017 in Hon'ble Principal Bench CAT New Delhi against the DOT order dated 05.07.2017 for withdrawal of additional increment by fixation in same scale on post based promotion under EPP came up for hearing on 06.11.2017 in the Principal Bench of Hon'ble CAT (Court No. 4). BSNL Advocate requested for supply of MA Copy and also requested for hearing date in the first week of December. AIBSNLEA advocate requested for immediate hearing. However, Hon'ble court posted the matter for further hearing on 28th November 2017. The SNEA leadership while uploading the secretly planned CCH (They themselves admitted in same posting) never related the existing pay scales with the proposed Hierarchy. As in reality those are perfectly matching with the DOT's order E1 for JTO, E2 For SDE and that is the reason for which all this secrecy about. Pl see how perfectly it is matched. E4 - DE/CAO ( Asst. GM). E5 - DE/CAO ( Asst. GM). i.e. 10 years in E3 scale in spite of a functional promotion in between. *Other pertinent points like fast track promotion, benefits for SC/ST are also missing in the proposal*. It is also interesting to note the attitude of AIGETOA leadership. As claimed by SNEA in their website, AIGETOA was also consulted while planning this secret CCH. If it is true how they gave consent to such system which is out and out detrimental to all the DRs of BSNL. *Finally on the point of secrecy. We have earlier experience on management formulating detrimental orders / schemes secretly,. This is the first time we are seeing the Majority Assn. is also becoming a part of the secret mission for damaging the cadre which they represent*. (a) Online tracking (Submission & Monitoring) of medical bills of BSNL Pensioners: GM (Admin) mentioned that vendor has been appointed to provide software in this regard and shortly this facility to BSNL Pensioners will be available wherein they can submit the medical bills & monitor the status of payment. (b) Medical cash payment to BSNL pensioners: GM (Admin) mentioned that medical cash payment facility to BSNL Pensioners was available upto 30th Sept., 2017 and now for extending the facility, proposal has been moved to the competent authority for approval. (c) Night free calling facility to Group-'A' level officers: GM(Admin) advised to discuss the matter with CMD BSNL. GS, President, FS & AGS (HQ) met CMD, BSNL expressed our serious resentment against unilateral decision for CPSU Cadre Hierarchy wherein the Khan Committee report has been diluted. Also, Sr. SDE / Sr. AO non-functional grades are made functional to stagnate the executives. We handed over our protest letter to CMD BSNL in person and mentioned that while framing the draft proposal on CPSU Cadre Hierarchy, Pers. Cell has not taken the views / suggestions of AIBSNLEA into consideration. Any deviation from Khan Committee report is not acceptable to us. CMD BSNL after detailed discussion assured to look into the matter and also advised us to discuss the matter with Director (HR). He will also speak to Director (HR) on this issue. B. Implementation of 3rd PRC recommendations in BSNL: We requested CMD BSNL to get an early approval on implementation 3rd PRC recommendations in BSNL with full 15% fitment benefits from the DoT as the same has been approved by the BSNL Board. CMD BSNL mentioned that BSNL Board approval on implementation of 3rd PRC report in BSNL has been sent to DoT for issuance of Presidential Directives. On the reporting of one Association that Hon'ble MOSC (I/C) is not in favour of 3rd PRC implementation in BSNL, CMD BSNL reacted that Hon'ble MOSC (I/C) is one step ahead than us to implement the 3rd PRC recommendations in BSNL and recently he had informal meetings with Secretary (T) and Hon'ble MOSC (I/C) and discussed the matter and requested for its implementation in BSNL. Hon'ble MOSC (I/C) and Secretary (T) both are working in speedy manner to approve the 3rd PRC report implementation in BSNL. CMD BSNL categorically mentioned that there may be some delay in getting approval from the Govt but 3rd PRC report will be implemented in BSNL. C. Increase in Superannuation benefits from 3% to 5%: We requested CMD BSNL to get approval of DoT on increase of Superannuation benefits from 3% to 5%. CMD BSNL mentioned that after the approval of BSNL Board to increase the Superannuation benefits from 3% to 5%, the proposal has been sent to DoT for issuance of Presidential Directives. We extended our sincere thanks for getting approved rhe 3rd PRC report implementation in BSNL with full 15% fitment benefits and increase in Superannuation benefits from 3% to 5%. The matter came up for hearing today in the Hon'ble Supreme Court and posted for final hearing after two weeks. 03.11.2017 GS writes to Shri Anupam Shrivastava, CMD BSNL, regarding deviation from Khan Committee report in draft CPSU Cadre Hierarchy proposal is not acceptable. Management Committee of BSNL Board has discussed & approved in principle the draft proposal submitted by PGM(Pers.) to BSNL Management Committee but BSNL Management Committee has advised Pers. Cell to have discussions & to take opinion of other executives' associations also mainly with AIBSNLEA before submitting the proposal to the BSNL Board for approval. Majority Executive Association in coordination with PGM(Pers.) has formulated the CPSU Cadre Hierarchy draft proposal wherein the recommendations on CPSU Cadre Hierarchy by KHAN Committee has been diluted / distorted which is against the terms & conditions of the assurances given before absorption to BSNL executives. The GS Majority Executive Association was also one of the members of KHAN Committee who signed the recommendations & now deviated from that. AIBSNLEA will protest against the such proposal which will harm the assured career progression. AIBSNLEA's consistent efforts yielded results in getting released the promotion orders from PS to PPS in Bihar Telecom Circle. We congratulates the beneficiaries. BSNL Corporate Office SEA Cell requests to arrange to forward a copy of APARs of all Telecom Finance Executives (AOs and above) upto the period ending 31.03.2016 duly Reported/Reviewed/Communicated and having been acknowledged by the executive concerned to the CS to Director (Finance) immediately. All the Circle Secretaries and District Secretaries are requested to kindly bestow their personal attention and arrange to send the desired APARs immediately to BSNL Corporate Office so that the concerned section be able to conduct CPC in a shorter span of time.